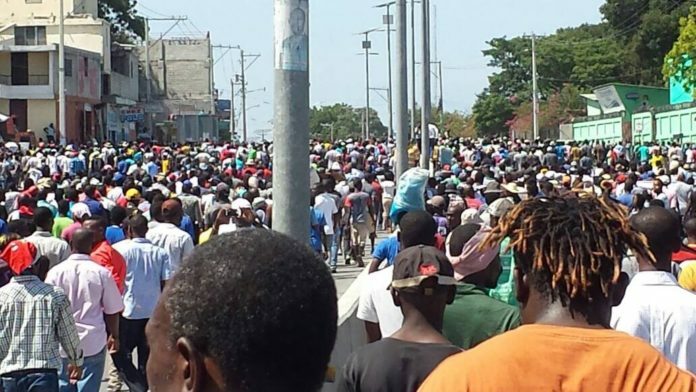 Massive, raucous demonstrations, sometime several times a week, have rocked Haiti’s capital, Port-au-Prince, and other provincial cities over the past two months and show no sign of subsiding, despite a lack of clear or unified leadership. Police repression of the demonstrators has grown as their calls have morphed from denouncing a tax-laden, fee-hiking, austerity budget proposed in early September to demanding the resignation of President Jovenel Moïse, who came to power in February following controversial, anemic elections in November 2016. In many ways the demonstrations resemble the Caracazo uprising that erupted in Venezuela in February 1989 after President Carlos Andrés Pérez’s government implemented a package (dubbed in Venezuela “ paquete”) of neoliberal economic reforms recommended by the International Monetary Fund (IMF). The measures, featuring privatizations, public employee layoffs, and tariff reductions, included slashing gas subsidies which resulted in a 30% hike in transportation costs overnight. The Caracazo revolt led to the 1992 coup d’état attempt and subsequent 1998 election of Hugo Chavez. Similarly, Jovenel Moïse’s Washington-influenced budget proposes a host of taxes and fees on everything from drivers licenses, vehicle registrations, and passports to a 10,000 gourdes ($157US) annual tax on expatriate Haitians. The starting gun for the current uprising was fired on Sep. 5 when Sen. Antonio Cheramy – previously a popular singer known as “Don Kato” – walked up to the podium where Southeast Sen. Ricard Pierre was reading the draft budget to the Senate, grabbed the document as Pierre was in mid-sentence, and began to theatrically tear it up, saying “this is over” (se fini) with every rip. As the session degenerated into shoving and shouting matches, Cheramy then appropriated the bell used to call the Senate to order and began parading around the chamber ringing it while repeating: “Stop the thieves!” (Bare volè). Videos of the disrupted session went viral on Haitian social media, and by the Fri. Sep. 8, thousands of protestors, reprising Cheramy’s words, surged into the streets of the capital. They’ve been there, usually several times a week, ever since. Former President Jean-Bertrand Aristide’s Lavalas Family party (FL) as well as the breakaway Dessalines Children Platform (PPD) of former Sen. Moïse Jean-Charles, have sought to lead the uprising, with Jean-Charles often being carried on the shoulders of demonstrators. Despite a joint press conference last week, the two parties, which were bitter rivals during the 2015 and 2016 elections, have not yet met to form a coalition between themselves or with other opposition currents or to craft a coherent programme that goes beyond the simple demand, increasingly heard in demonstrations, for Jovenel to resign. In addition to encouraging the police to fire tear gas, water cannon, and bullets at demonstrators, the government has also tried to mobilize, so far unsuccessfully, counter-demonstrations. 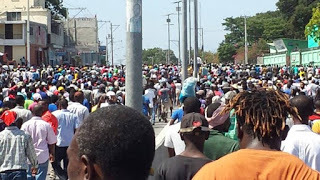 As Jovenel returned on Sep. 22 to Port-au-Prince from speaking at the United Nation’s General Assembly on Sep. 21, he attempted to march with a few hundred supporters – many of them in various military fatigues and brandishing automatic weapons (while the Defense Minister disavowed any actions they might take) from the airport to the National Palace. The occasional rocks and bottles which flew at the presidential cortege from the slums that line the airport road became a veritable hail storm by the time the procession reached the intersection with the Delmas Road (about halfway), and shots began to ring out. Jovenel’s parade quickly scattered as partisans and officials scrambled to their vehicles, speeding off toward the Palace with their sirens wailing. Opposition politicians are also alarmed because Jovenel, and the Parliament which is dominated by his Haitian Bald-Headed Party (PHTK) and its allies, are preparing to name a Permanent Electoral Council, which will oversee elections for the next decade. Since the Constitution was ratified in March 1987, electoral councils have always been provisional, generally reflecting a political compromise between the contending political currents in any given “conjoncture,” as Haitians call the political situation. 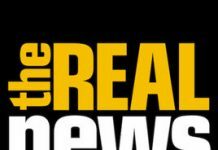 Meanwhile, “armed civilians aboard three vehicles attempted to intimidate protesters Tuesday morning in the streets of Pétion-Ville, firing shots at the start of a rally banned by the government,” the Rezonodwes.com website reported. “Witnesses identified a white Chevrolet Colorado pickup truck without a license plate, a white Isuzu pickup [with license plate] SE 01824 owned by the Haitian State Lottery (LEH), [and] a black Nissan Patrol all-terrain vehicle registered IT 04936.” In a video, one of the men from the white Chevrolet pulled out a handgun and fired 24 shots in rapid succession in the air in an attempt to scare off gathering demonstrators. The police ban and the armed intimidation had the reverse effect, swelling the ranks of protestors, who remained peaceful. Other than some scatter-shot projects like a solar power array in the far western town of Les Irois or improvements on a 19-mile section of road between Camp Coq and Vaudreuil in the North, Pres. 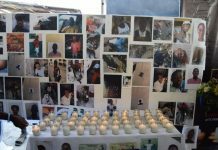 Moïse has little to show for almost nine months in office, in large part because millions of dollars and many weeks of precious time have been wasted on a so-called “Caravan for Change,” which is little more than a combination Carnival and political rally held in different towns around Haiti. As charges of runaway government corruption have multiplied (much of it involving the cash sloshing around Caravan events), Jovenel illegally decapitated the state’s two corruption-monitoring agencies, replacing respected directors with his own cronies. Despite its divided, inchoate leadership, an anti-austerity, anti-neoliberal mass movement appears to have been unleashed. 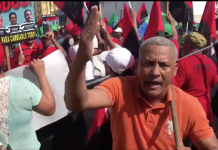 An opposition coalition came together in New York to organize very successful demonstrations against Jovenel during his passage there in late September. A similar coalition may emerge in Haiti in the weeks ahead. Recent Haitian history suggests that, once such a movement gains momentum, Jovenel Moïse’s government will have great difficulty putting the genie back in the bottle.